Bionic Briana: Walking thru the spiderwebs. 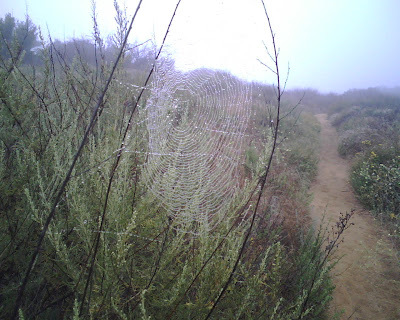 I took this picture on my trail run (see blog entry below) and I couldn't believe how big this spiderweb was!! Because of the misty morning and all the dew the spiderwebs became visible and they were EVERYWHERE!! A few times the webs were right across the trail and I'd have to duck under them or break part of it so I could climb over. I didn't see any of the owners of these webs but I'm sure that they were HUGE and hairy spiders! Creepy!! Eeeeww! In St George right now, the bugs are everywhere. Yesterday Little Cam found 4 cockroaches in the basket of his bike. I still get the heebies just thinking about it. The webs are pretty, though. You trail run sounded awesome. That marine layer is magical, isn't it?